Taiwan has been identified as one of the world's best locations for both onshore and offshore wind energy. The Taiwan government has set ambitious goals to cut carbon emissions and increase the proportion of electricity generated by renewables to 20% of capacity by 2025. The passage of amendments to the Electricity Act in January 2017 added further impetus to the momentum. In the wake of these developments, dozens of European, multinational and Taiwanese firms are preparing for the promising market that will be unleashed for all players in the wind energy supply and service chain and financial institutions backing them. All the right ingredients are in place to spur a rapid increase in wind energy development. All that is needed is the right regulatory environment and incentives to kick-start a bright new era for wind energy in Taiwan. This conference has been organised to bring all the key players in the wind industry together to chart the best course forward for the wind industry in Taiwan. The conference will bring together industry experts and regulators from Europe and Taiwan, including WindEurope's Chief Policy Officer and KfW's Head of Wind Power, and an expected audience of 250 people, which will include senior executives from the wind and financial industry, investors and NGOs. 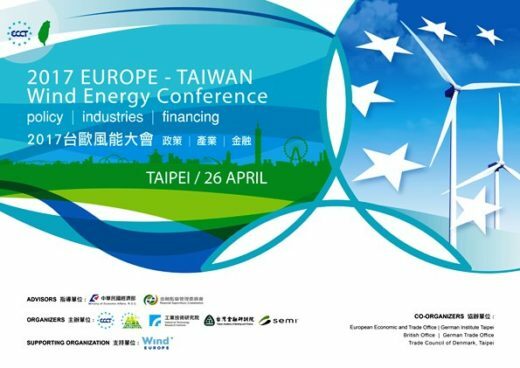 The ECCT Low Carbon Initiative (LCI) is previliged to have WindEurope's support to 2017 Europe-Taiwan Wind Energy Conference on 26th April in Taipei. WindEurope, just awarded "Overall Best European Association" at the European Association Awards 2017, with over 450 members, active in over 50 countries, advocating and promoting wind power in Europe and worldwide. WindEurope in June and November 2017 is holding two wind events in London and Amsterdam. You are encouraged to regsiter and explore more opportunities in wind.